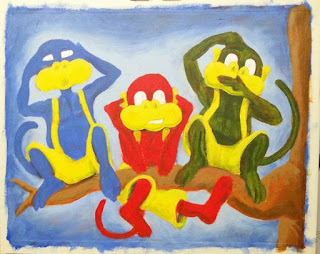 Work continues on my Three Wise Color Monkeys, acrylic painting. Last post I had just begun Stage 3, painting in all the base colors. At this point I've now completed all the base painting and am moving into the next stage. As you can see from the image my base colors layer is still very rough but I'm starting to be much more mindful the edges - where one color stops and another begins. This stage is all about solidifying my base colors and then giving some form to everything through adding shadows and areas of light (but not usually any white highlights, which I tend to add toward the final stages). There's not really a lot to say about this stage. Usually, I just pick where I think the main light source is (often that'll be overhead daylight) and highlight and shade areas of my image accordingly. Overall my painting becomes much tighter, with sharper edges and somewhat smoother colors. Watch the video below for more detail and to see the artwork being painted at speed. Once this work is done, I'll move on to the final stage of adding small details and highlights, using black and white paint mostly. By next post the painting should be pretty much completed.